I am one of the most easygoing down to earth person to know or work with. I am Always motivating every one and making sure people are doing ok. I had a fever on Thursday cos the rain beat me on Wednesday. I still worked hard from 10am til 1am at night. I went to 3 different supermarket to buy food stock because Lanre wants Receipts. Yet I still get slapped 3 times. Do I deserve this? I still worked even though my salary hasn't been paid yet no my percentages from the bar sales given. He promised to pay but still hasn't since May 18th. Please tell me if I deserve to be slapped, not once but 3 times by Mr. Lanre Nzeribe? What happened? We had a 3rd party Live band event. He wanted me to give him N8000 from the sales. I said to wait until I tally the percentage with the 3rd party for their 30% commission so there is transparency. He insisted I give him the 8k, I told him to take the money himself since it's his Lounge and he said I was fired and I said over 8k and the Slap came. It landed on my surgery jaw and it has been bleeding since. LANRE slapped me twice on the jaw and once on my other jaw and the impact of the last slap connected me to the fridge in the kitchen. Now I have a bruised back and a bleeding jaw. Please for N8000, Do I deserve to be slapped 3 times? Whether he was drunk or high, no man has a right to slap a woman. Size difference apart. 8k shouldn't lead to a slap.... Please tell me if I deserve to be slapped, not once but 3 times by Mr. Lanre Nzeribi????? 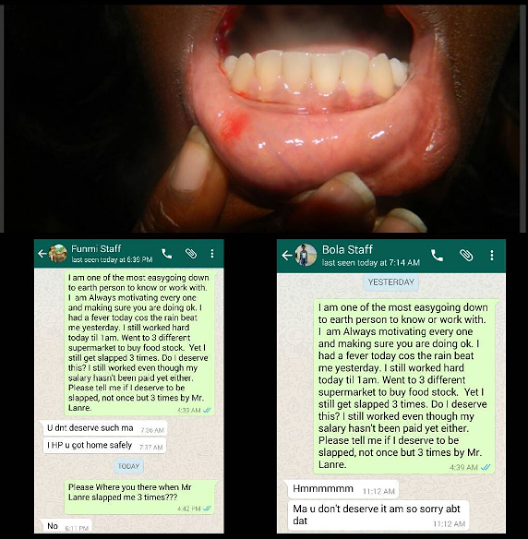 Apparently some staffs who initially said I didn't deserve to be slapped have started changing their story why? Are they condoning Female assault at work? Are they Hiding the truth so they don't get sacked or slapped or is it for fear of not getting their salary? I take daily selfies and write motivational message daily. I have never been slapped before in all my life and coming home to Nigeria after 18years in America puts a bad taste in my mind. 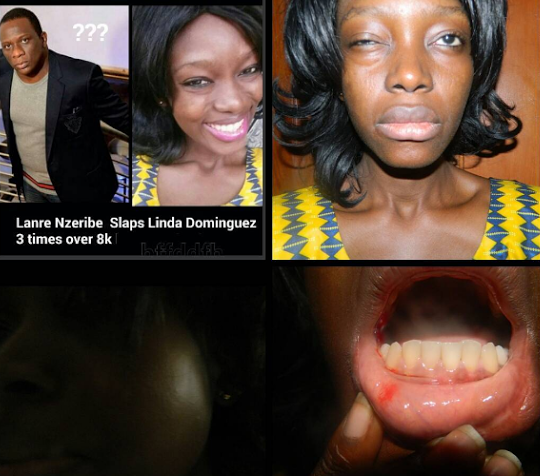 It has come to our notice that a certain Linda Dominguez who is an ex employee of Davinci Fashion Lounge has been reaching out to bloggers trying to taint the person of Mr. Lanre Nzeribe our CEO through allegations of domestic violence. We wish to state clearly that no such thing transpired. Linda Dominguez has worked for the club for only one month and had misappropriated funds from the running of the Business. She had been informed that she had to account for the missing funds or get fired especially as a report of theft had been lodged against her at the Police Station. 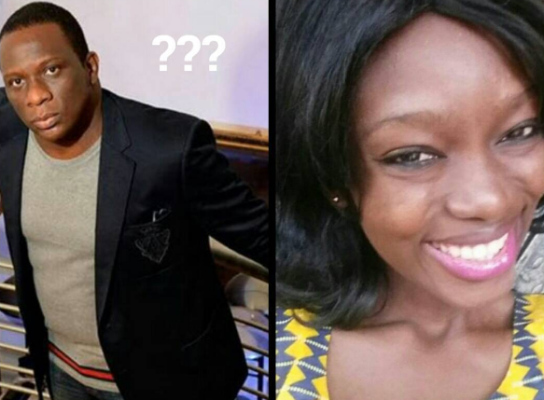 On the night of the alleged slap, she had been fired for being rude to Mr. Nzeribe before other members of staff, and was directed to handover company documents in her possession. So she held on tightly to the documents while Mr. Nzeribe tried to retrieve them from her and she started screaming 'you slapped me, you slapped me, it's going on the blogs that you slapped me' to the consternation of all who were present . She had it all planned out. Linda Dominguez is a social climber who wants to become a celebrity by all means and has chosen Mr. Nzeribe as a target to achieve this. Linda Dominguez is trying to put up drama in the wake of the ongoing intolerance of domestic violence against women, also because she had been fired and was asked to account for missing funds. Her brother is also a culprit in the siphoning of company funds. Thank you for practicing real journalism by seeking our side of the story.